With contributions by Fouad Asfour and Martin Guttmann. The diverse and multi-media art work of Christian Mayer isn't just compelling regarding detailed retelling of history, but also in the specific (re) presentation and contextualization. 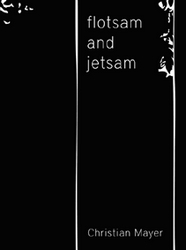 In "flotsam and jetsam" one encounters his methodology in simple and perfect precision. History is not only made, it also disappears rapidly and there seems Mayer's analytical interest and critical thinking to be set. Knowing that in times of cultural hybridization binary distinctive categories work poorly, he generally works with aspects of the intersection of visual and linguistic signs, representation and communication systems.